Remove the top of the coconut. Remove the coconut water and scrape out some of the coconut flesh and set aside. Slice the fish and prawns. Prepare spice paste by blending all the ingredients together. Combine the spice paste with the beaten eggs. Season with the anchovy and chicken stock powder, sugar, pepper and salt. Add the coconut milk and kaffir lime shreds. Line steaming pan with kaduk leaves. 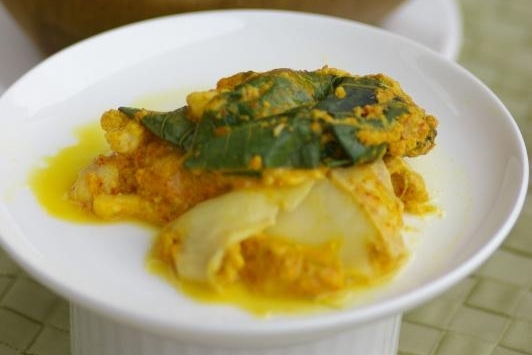 Arrange fish slices and prawns on the leaves and pour in the custard mixture. Top with the reserved coconut flesh. Bring water to a rapid boil and steam the mixture for 18-20 minutes. Scoop otak-otak into the coconut shell or plate. Serve with rice or toasted bread.